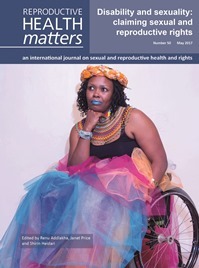 Reproductive Health Matters is pleased to publish its 50th journal issue! Over the past 25 years, RHM has supported new thinking about sexual and reproductive health and rights and it continues to challenge hegemonic assumptions about sexuality and reproduction. This issue includes research, personal experiences and critical analyses that address the current situation and future potential with regard to the sexuality and SRHR of people living with disabilities.